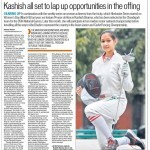 Kashish yet again makes headlines for her achievements in the field of fencing. There are no words to express how proud we feel about her. She is a perfect role model for all youngsters.